Fall is the best season to be stylish, as this is the time when designers unleash their latest collections. If you want to keep up with the latest trends in the fashion world, then perhaps it’s best that you wear either animal or reptilian prints for your scarfs for fall. Camel, snake, and crocodile prints never go out of style, as they are symbols of luxury and high fashion.. Fall shawls of these patterns promote a sense of sophistication and female strength, you may want to wear these shawls when going to dinners or parties so that you can stand out. Meanwhile, if you want to wear rather classic but not the uber-high fashion type of scarfs for fall, then go for the burnt browns. These range from dark tans to orange-browns, just like the colors of falling maple leaves. These shades are undeniably timeless, and work well with almost every kind of outfit. Dark orange scarves compliment light-colored tops, such as cream, white and yellow outfits. On the other hand, you can wear lighter shades of burnt browns on darker browns, blacks, and greens, as they create a striking contrast against each other. If you want to add something extra on your neck without actually wearing some bling, then why not opt for studded fall shawls? A lot of studded shawls and scarfs for fall are starting to surface these days, as they appeal more to the younger generation. These types can be worn to compliment the jeans and shirt combo and other street casual outfits. If you are trying to maintain a sense of sophistication on your scarves, then you may want to go for cream-colored studded scarfs instead. 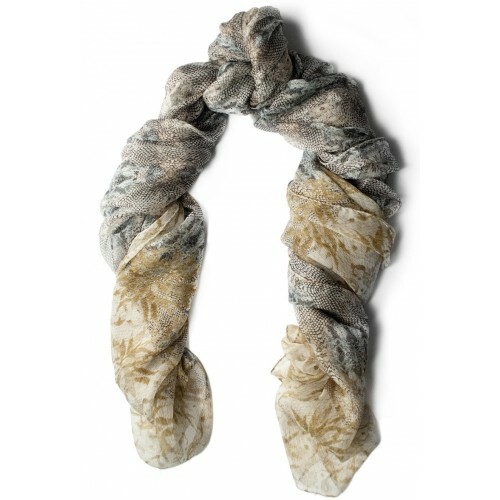 These scarves tend to be universal, meaning they work well with prissy and urban styles without actually looking off. Meanwhile, if you are still feeling the warmth of the summer and would like to maintain the nostalgia this season, then go for leaf-patterned silk fall shawls. These shawls tend to be warm on the skin because of the fabric material, but at the same time they can be breezy to look at because of the leafy inspirations. It is also easy to match these scarves and shawls on various outfits, from dresses to tops and even plain shirts. In short, you can never go wrong with neckpieces of this kind.